What is a monastery? I believe a monastery is an experiment in love. For Buddhists, love is the wish for all sentient beings to have happiness and its causes. When we ordain as Buddhist monastics, we commit to loving ourselves: we turn away from the low-grade, transient happiness of cyclic existence, and we dedicate our lives to creating the causes for the highest happiness of nirvana and full awakening. This is difficult to do alone, so we enter a monastery where we live in monastic community, a structure within which we commit to loving each other. We do our best to support each other to create the causes for the highest happiness. I once heard an abbess of a nunnery in Taiwan say, “I feel that anyone who becomes a monastic must have a good heart. My job is to protect the heart of those who wish to live as monastics.” This is the job not only of the abbess or abbot, but of all of us who live in a monastic community: to see our own and each other’s good heart, and to nurture and protect each one. By loving ourselves and each other, we then commit to extending our love into the world. At Sravasti Abbey we do our best to love whoever shows up at our door, plus all beings that live on our land and beyond, seen and unseen. We commit to loving all of existence for as long as it takes, until we become more than love itself: we become Buddha. Because Buddha is more than love—Buddha is compassion, wisdom, all good qualities developed to their fullest potential. This is what each of us is capable of achieving together. But—and of course there’s a but—this is an experiment. For each day we try to love, we also fail. Each day we have moments where we fail to love ourselves, where we are hypnotized by beliefs like, “If only I were different, if only I were not so stupid, so wrong, so broken. If only I had that quality, that object, that person, that experience, I would be happy. I must have it for myself.” It takes awareness and courage for us to recognize and question such thoughts that seem so real. We also fail in our attempts to love each other. “Why is so-and-so like this? Why can’t they be different? Why do they keep doing things that way? What is the point of even talking to them? I will avoid them as far as possible.” Each day we learn the limits of our love. But with every failed experiment, we gain wisdom. We all know the many clichés about failure being the mother of success, and clichés have their truth. So we keep failing, we keep learning, and we grow. What especially helps us in our experiment as Buddhist monastics is living in clear guidelines on ethical conduct, which we believe is the primary cause for true happiness. We’re guided by the Vinaya—the Buddha’s ethical instructions—to restrain our body and speech so we don’t harm ourselves or others. We’re guided by bodhisattva precepts to train our mind to benefit ourselves and others. We live in our precepts out of love, and it hurts when we break them. And we do break them. As ordinary beings, our love is not strong enough. Fortunately, we can confess, purify, and make amends. That said, I believe that people who come together and dedicate their lives to figuring out what it means to love and how to love share something deeply in common, even if our methods for generating love may differ. Monks and nuns are so ambitious that we want to extend our love to every single being without exception, and monasteries are rare and precious places where we can test and expand the limits of our love. Some years ago, the Sravasti Abbey community visited the Catholic Sisters of the Holy Names of Jesus and Mary in Spokane, Washington. One of the nuns, Sister Mary Ann Farley, came to have lunch at the Abbey after that. Although our religious beliefs are different, we experienced an immediate sense of connection, a shared reality as spiritual practitioners living in community. Last year, I watched a short film called “To Close a Monastery,” about the Abbey of our Lady of Holy Trinity in Huntsville, Utah closing down. The Catholic monastery was one of many that had sprung up in America after the Second World War. It started out with 84 monks, many of them veterans. After the war, they wanted to learn how to love. 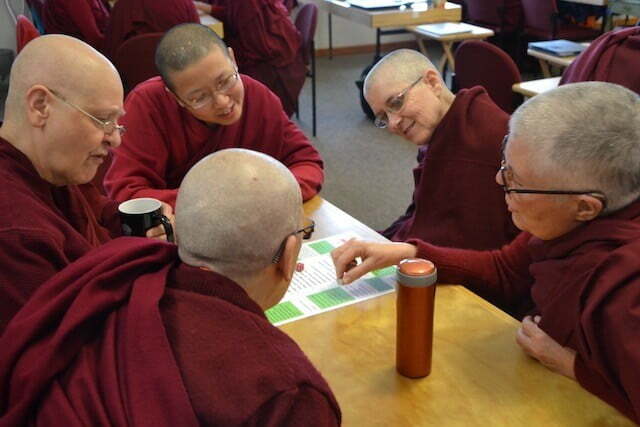 In the video, you can really see the joy the monks had living in community. However, by 2017 there were only six monks left. For 30 years, no one new had ordained there, and the monks were so old that they required assisted living, so they decided to close the monastery. Although I’m not Catholic, I cried watching this video, maybe because I wondered, did this experiment in love fail completely? Watch Venerable Damcho share this reflection online.